“The problem with America’s Christianity today is that, for the most part, it doesn’t exist! What passes for Christianity is instead an anemic, spineless, diluted substitute without convictions or principle. Exactly! The need for a revolution is urgent! By the way, great job on the blog, Kels! Great thoughts…sad but very true! Thanks for stopping by! So ? what are we going to do about it ? Nice blog Kelsey, I see you are doing something! I cannot understand a solution until I understand a problem. The clearest evidence of my lack of understanding the problem is the ineffectiveness of my solution. That the doctrine of most Christians is an ineffective solution says in vast volumes how those same Christians do not understand the problem. If they did, they’d get the solution provided to them by Jesus Christ and through Jesus Christ. 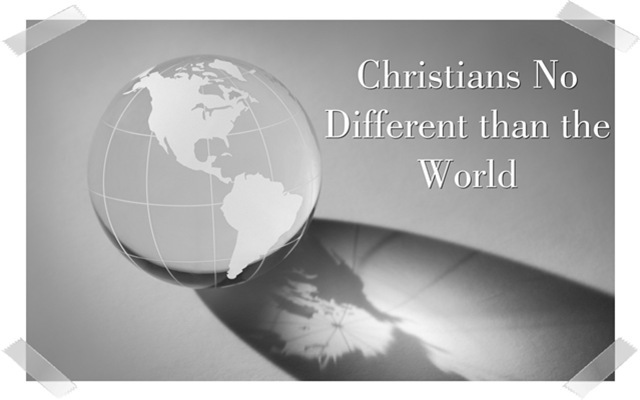 That Christians are ineffective at being appreciably different than the world is testimony of vast ignorance. So — what are we ignorant of? First, we are ignorant of HOW we work (in lust, sin, mind and emotions). Second, our ignorance is not limited to Christians, but is shared by non-believers as well. Third, the ineffective brand of doctrine held by the majority of American Christians is laced with self-delusion and is actually being generated from the problem of humanity: in other words — the HOW we are broken is actually producing a the self-delusional doctrine that we flail about with in vain attempts at living and walking in an effective solution to our illness. I walked in this ignorance for more than 20 years. I named the name of Jesus Christ as Lord and Savior. I claimed being Spirit-filled, speaking in tongues and became a raging fanatic for Christ. Yet, while I was naming Christ as Savior, I was growing in cycles of sin, both in shorter cycles from failure to failure, but also in the depth and depravity of my sin. After 20 years, my ignorance had brought me to a shattered marriage and a life of depravity and depression. It was on Christmas Eve, 2004, at the lowest point I have yet been in, the Lord Jesus was finally able to deliver to me a spark of inward sight that would open the eyes of my understanding. What I experienced in the beginning and what I thought I knew to be truth in the beginning has been a journey from dark into light. I never lost my firm 100% belief that Jesus Christ is the Son of God, the great I AM, but I needed to journey through some dangerous doctrine to get to the reality of the gospel. Of late, the Lord Jesus Christ has done just that. If you read my blog (a few from the beginning and then more from more recently), you’ll see this transition taking place and shape. I hope that something in it will be helpful to you. May the Lord Jesus Christ richly bless you in ALL spiritual blessings.